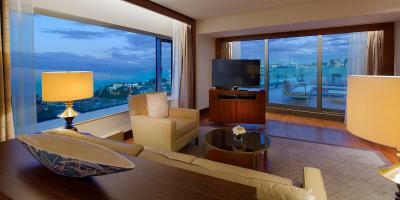 Lock in a great price for Conrad Istanbul Bosphorus – rated 8.6 by recent guests! Fabulous service from executive lounge concierge Fatih! Such a client oriented attitude. Took care of all our requests and delivered what promised. Well done! Also Room cleaning was 5 out of 5. Cleaning lady was eager to help and do even beyond her responsibilities. If I am not mistaken her name was Cahan. 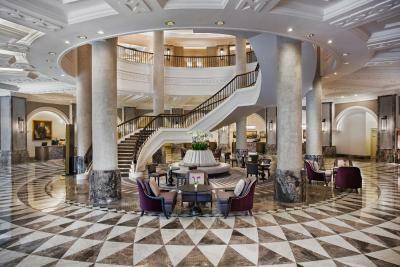 Overall, I must say that Conrad will probably remain as a hotel of choice for my next trips to Istanbul. All staff were very kind and helpful. Room was clean and tidy. All equipments in the room were fine. Location is perfect. Great bar and restaurant at the roof. Recommended hotel for stays in Istanbul. The location was great and near from the mist important facilities in Istanbul. The staff were great, polit, helpful and always smiling. Rooms are ckwan, big and comfortable. Tge breakfast is more than great. 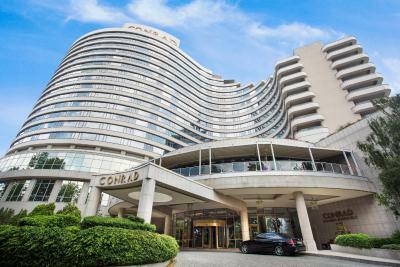 Conrad Istanbul Bosphorus This rating is a reflection of how the property compares to the industry standard when it comes to price, facilities and services available. It's based on a self-evaluation by the property. Use this rating to help choose your stay! 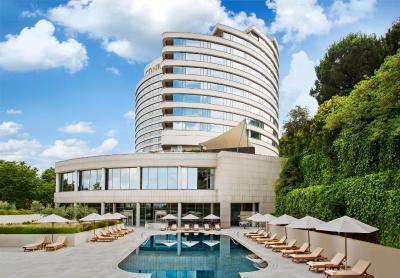 One of our top picks in Istanbul.Located in the city center, the award-winning Conrad Istanbul Bosphorus features terraces with panoramic views of the Bosphorus. 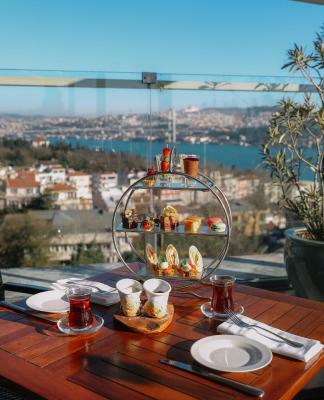 Featuring luxurious rooms and upscale suites with a contemporary design and Bosphorus views, the hotel is within walking distance from the Bosphorus and Dolmabahce Palace. Ferry port is just a few minutes' walk away, offering easy access to the Asian side of the city. 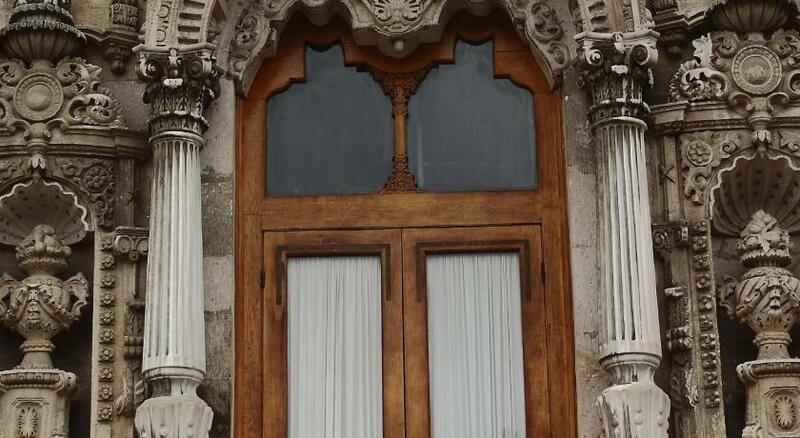 Dolmabahce Palace and Vodafone Park Stadium can be reached with a pleasant 10-minute walk through Yildiz City Park. 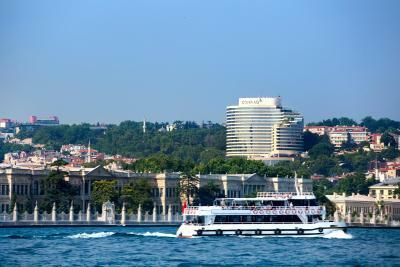 Ortakoy district, Kabatas Tram Station and Funicular Stations are a 20-minute walk from Conrad Istanbul Bosphorus. There are a variety of cafés, restaurants, shops and boutiques with its colorful neighborhood culture, and entertainment areas by the sea. 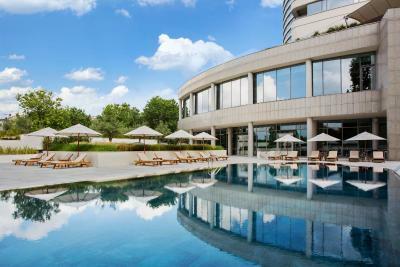 Zorlu Shopping Center is a 10-minute drive away. 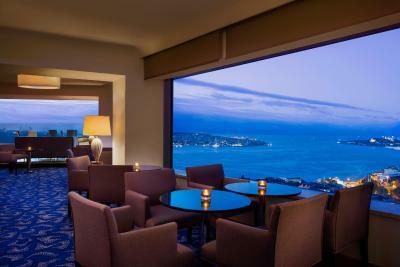 With a contemporary décor and luxurious furnishings, Conrad’s rooms feature a seating and work area. 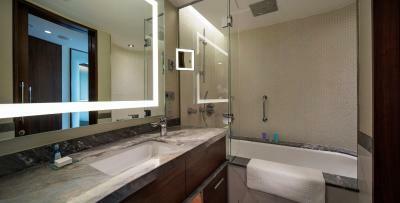 All rooms have a marble bathroom equipped with luxury amenities. Each room offers a satellite LCD TV, complimentary WiFi, Nespresso coffee machine and an iHome docking station. 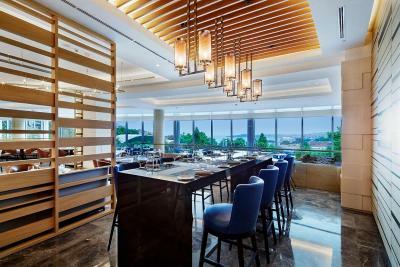 In-house dining options include Manzara Restaurant, serving breakfast, lunch and dinner with an open-kitchen concept and offering delicacies from Mediterranean cuisine accompanied by views of the Historic Peninsula and Bosphorus. 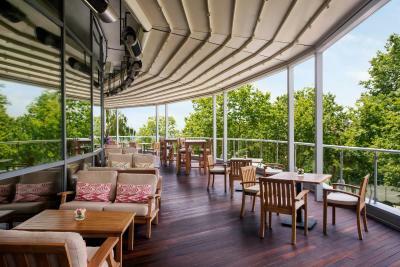 Summit Bar&Terrace on the 14th floor provides rich alcoholic beverage options, cocktails and appetizers with views of the city and Bosphorus. 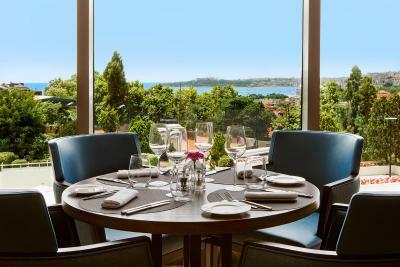 Selected as Europe's Leading City Hotel of 2015 and Turkey's Leading City Hotel in 2016 and 2017 by World Travel Awards, Conrad Istanbul Bosphorus has 3 clay tennis courts on site with indoor and outdoor options. 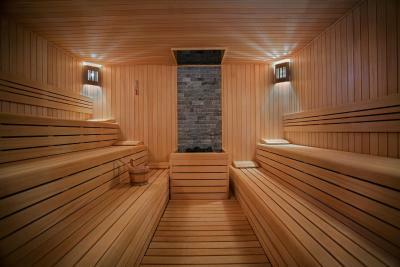 Leisure facilities also include a renovated spa facilities, 24-hour open fitness center, Turkish hammam and a tennis court which can be used throughout the day. 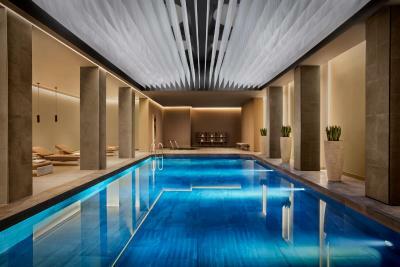 You will find indoor and outdoor pools as well. 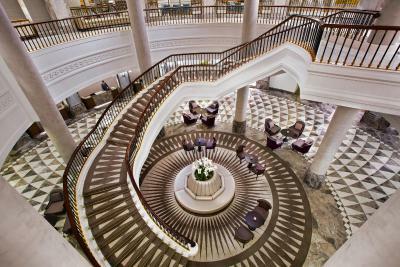 The hotel also offers business facilities and meeting rooms for your professional needs. Istanbul Airport is 32 mi from Conrad Istanbul Bosphorus. 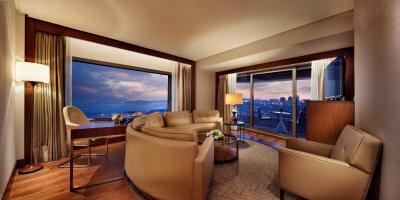 When would you like to stay at Conrad Istanbul Bosphorus? Renovated in 2015, this stylish room includes a range of modern amenities including an LCD TV with multinational channels, iHome dock station, free WiFi and a Nespresso coffee machine. Featuring a contemporary design, the room has large double-aspect windows, a work desk, feather and down pillows, and 300-thread-count sheets. The marble bathroom comes with luxury bath amenities including Tara Smith Vegan Hair Care, Refinery, Aromatherapy Associates and Shanghai Tang. You will find a shower or bathtub in the bathroom. Guests of this room have free access to Health Club. 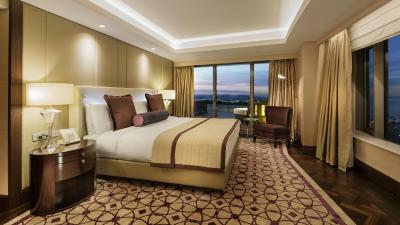 24-hour room service, turn down service and a complimentary bottled water are also available in the room. Private parking is available at a location nearby (reservation is not possible) and costs EUR 5.50 per day. This stylish room includes a range of modern amenities including an LCD TV with multinational channels, iHome dock station, free WiFi and a Nespresso coffee machine. 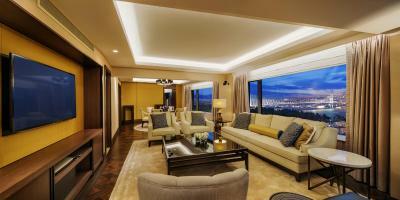 It also offers stunning Bosphorus view. Room has large double-aspect windows, a work desk, feather and down pillows, and 300-thread-count sheets. The marble bathroom comes with luxury bath amenities including Tara Smith Vegan Hair Care, Refinery, Aromatherapy Associates and Shanghai Tang. You will find a shower or bathtub in the bathroom. 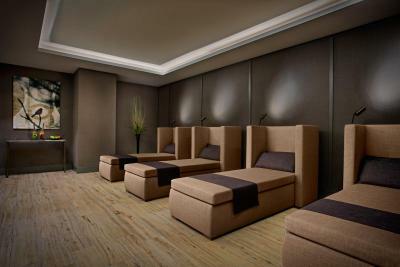 Guests of this room have free access to Health Club, and Executive Lounge. This stylish room includes a range of modern amenities including an LCD TV with multinational channels, iHome dock station, free WiFi and a Nespresso coffee machine. Park view is also offered. Featuring a contemporary design, the room has large double-aspect windows, a work desk, feather and down pillows, and 300-thread-count sheets. The marble bathroom comes with luxury bath amenities including Tara Smith Vegan Hair Care, Refinery, Aromatherapy Associates and Shanghai Tang. You will find a shower or bathtub in the bathroom. This air-conditioned room offers flat-screen satellite TV and mini-bar. The private bathroom comes with a shower, slippers and free toiletries. You will find a shower or bathtub in the bathroom. 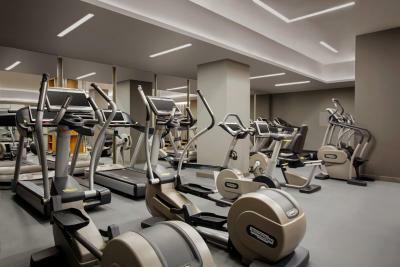 Guests of this room have free access to Health Club and Executive Lounge access. Complimentary airport transfer service at arrival from Ataturk Airport is offered. 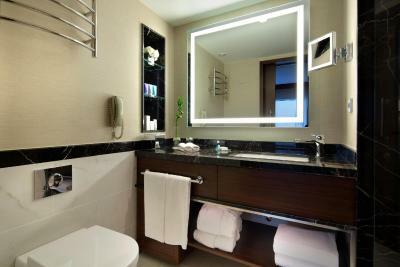 In-room check-in, separately for men and women special VIP setup in bathroom are available. This stylish room includes a range of modern amenities including an LCD TV with multinational channels, iHome dock station, free WiFi and a Nespresso coffee machine. Park view is also offered. The room has large double-aspect windows, a work desk, feather and down pillows, and 300-thread-count sheets. The marble bathroom comes with luxury bath amenities including Tara Smith Vegan Hair Care, Refinery, Aromatherapy Associates and Shanghai Tang. You will find a shower or bathtub in the bathroom. Renovated in 2015, this stylish room includes a range of modern amenities including an LCD TV with multinational channels, iHome dock station, free WiFi and a Nespresso coffee machine. It offers park view. Featuring a contemporary design, the room has large double-aspect windows, a work desk, feather and down pillows, and 300-thread-count sheets. The marble bathroom comes with luxury bath amenities including Tara Smith Vegan Hair Care, Refinery, Aromatherapy Associates and Shanghai Tang. You will find a shower or bathtub in the bathroom. This stylish suite features wood laminate flooring, and it includes a separate living room with a 46-inch LCD TV, and a bedroom with a queen-size bed and a 40-inch LCD TV. 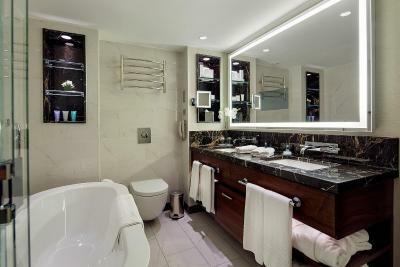 The marble bathroom comes with a bath tub or rain shower, mirror TV, and luxury bath amenities including Tara Smith Vegan Hair Care, Refinery, Aromatherapy Associates and Shanghai Tang. Featuring a contemporary design, the room has feather and down pillows, 300-thread-count sheets, iHome dock station, free WiFi and a Nespresso coffee machine. Guests of this room have free access to Health Club and Executive lounge besides in-room check-in and fresh flowers in the room are offered. 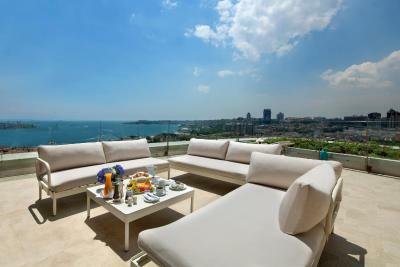 Offering spectacular views of the Bosphorus and Old Town Peninsula from the furnished balcony or large windows. this stylish suite features wood laminate flooring, and it includes a separate living room with a 46-inch LCD TV, and a bedroom with a queen-size bed and a 40-inch LCD TV. The marble bathroom comes with a bath tub or rain shower, mirror TV, and luxury bath amenities including Tara Smith Vegan Hair Care, Refinery, Aromatherapy Associates and Shanghai Tang. Featuring a contemporary design, the room has feather and down pillows, 300-thread-count sheets, iHome dock station, free WiFi and a Nespresso coffee machine. Guests of this room have free access to Health Club and Executive Lounge. Complimentary private VIP airport transfer service at arrival from Ataturk Airport , special VIP set-up and fresh flowers in the room are also available. Renovated in 2015, this stylish suite includes a separate living room with a 46-inch LCD TV, and a bedroom with a queen-size bed and a 40-inch LCD TV. 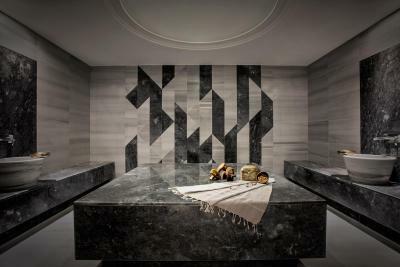 The marble bathroom comes with a bath tub or rain shower, and luxury bath amenities including Tara Smith Vegan Hair Care, Refinery, Aromatherapy Associates and Shanghai Tang. Featuring a contemporary design, the room has feather and down pillows, 300-thread-count sheets, iHome dock station, free WiFi and a Nespresso coffee machine. Kids menu can be served in the room. Baby sitting is available upon request. There are also books and puzzles. Guests of this room have free access to Health Club. Renovated in 2015, this stylish room includes a range of modern amenities including an LCD TV with multinational channels, iHome dock station, free WiFi and a Nespresso coffee machine. 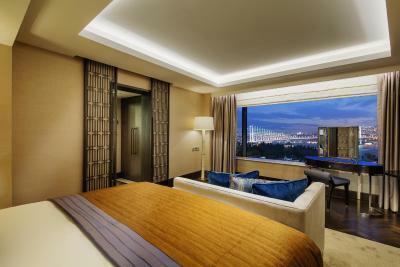 It also offers stunning Bosphorus view. Featuring a contemporary design, the room has large double-aspect windows, a work desk, feather and down pillows, and 300-thread-count sheets. The marble bathroom comes with luxury bath amenities including Tara Smith Vegan Hair Care, Refinery, Aromatherapy Associates and Shanghai Tang. You will find a shower or bathtub in the bathroom. Guests of this room have free access to Health Club, and Executive Lounge with complimentary refreshments and drinks throughout the day. 24-hour room service, turn down service, a complimentary bottled water in the room, complimentary use of meeting room for 2 hours up to 5 guests (subject to availability), and complimentary ironing service up to 3 pieces are also available. 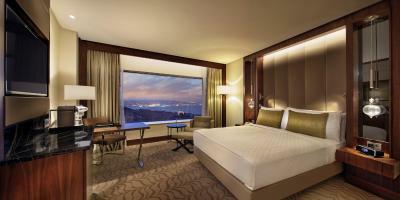 Guests of this room have free access to Health Club and Executive Lounge. In-room check-in, special VIP set-up and fresh flowers in the room. This stylish suite features wood laminate flooring, and it includes a separate living room with a 46-inch LCD TV, a dining area, a bedroom with a queen-size bed and a 40-inch LCD TV. The marble bathroom comes with a bath tub or rain shower, mirror TV, and luxury bath amenities including Tara Smith Vegan Hair Care, Refinery, Aromatherapy Associates and Shanghai Tang. Featuring a contemporary design, the room has feather and down pillows, 300-thread-count sheets, iHome dock station, free WiFi and a Nespresso coffee machine. 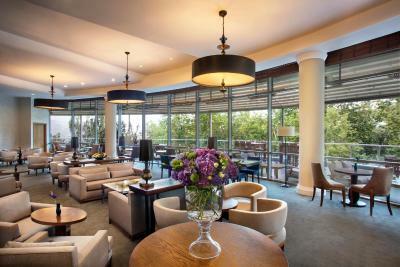 Guests of this room have free access to Health Club and Executive Lounge. Complimentary airport transfer service at arrival from Ataturk Airport, in-room check-in, special VIP set-up and fresh flowers in the room. 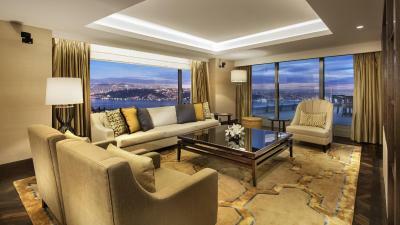 Exquisitely designed and decorated with modern art details, this spacious suite offers panoramic views of Bosphorus and the city from its furnished terrace with heating and large windows. Renovated in 2015, this stylish suite features wood laminate flooring, and includes a separate living room with a 46-inch LED TV, separate working area with a 55-inch LED TV, kitchenette, dining area, gym, a bedroom with a queen-size bed and a 40-inch LED TV, and an extra guestroom with a king-size bed. The suite offers private entrance to the bedroom separate from the main entrance of the suite. 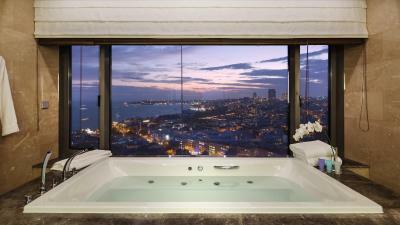 The marble bathroom comes with a sauna and spa bath overlooking the Bosphorus, mirror TV. Featuring a contemporary design, the room has feather and down pillows, 300-thread-count sheets, iHome dock station and a Nespresso coffee machine. Guests of this room have free access to Health Club, and Executive Lounge with complimentary refreshments and drinks throughout the day. Accommodating up to 4 people, this family room has one king size bed, two twin beds and marvelous city view through its large, soundproofed windows. Decorated in Turkish style, two bathrooms are complete with a marble bathtub or rain shower, and makeup mirror. You can recharge with bottled water and a snack from the mini-bar. Additional amenities include a desk with adjustable lamp and complimentary use of bathrobe and slippers. 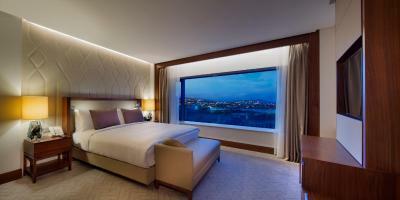 Accommodating up to 6 people, this suite with Bosphorus view features two bedrooms, a living room connecting to either a twin bedroom or king bedroom, and two bathrooms equipped with rain showers. Decorated in Turkish style, two bathrooms are complete with a marble bathtub or rain shower and makeup mirror. 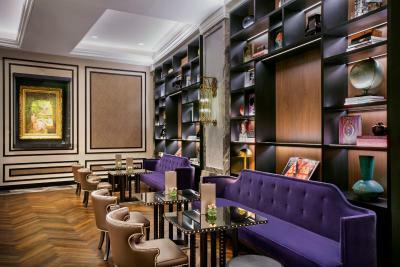 You can enjoy exclusive access to the hotel’s Executive Lounge, serving complimentary continental breakfast, drinks and snacks throughout the day. Featuring panoramic Bosphorus view from the heated terrace with seating and dining table, this 312 ft² includes a king bed, a lounge chair and a 40-inch LED TV in the bedroom, 46-inch LED TV in the living room and working room. You can relax in the bathroom with stylish bathtub or separate shower. Guests are offered VIP arrival airport transfer with, in room check-in and fresh flowers. Two hours of meeting room usage is provided upon availability. 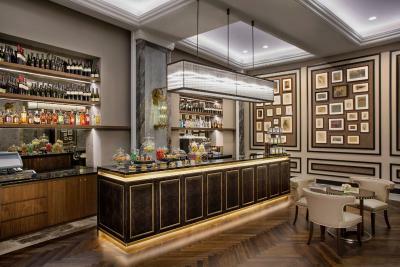 You can enjoy exclusive access to the hotel’s Executive Lounge, serving complimentary continental breakfast, drinks and snacks throughout the day as well as ironing for three pieces clothing. Please send your flight details to the property beforehand for airport transfer. 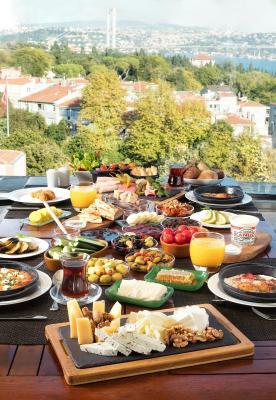 Please check our offers of 1, 3 or 5 hours to explore Istanbul at our stayinspired.com website. Straddling the borders of two continents, Istanbul is possessed of not just extraordinary cultural riches but unmistakable soul. That mix of intertwining histories and unassuming Turkish hospitality… This is a city that gives you more the more you look. Our itineraries are just the beginning. Experience tastes and flavours that are beyond compare, in a range of exceptional bars and restaurants quite unlike any other. You can get between these unforgettable choices: •	Afternoon tea; Sip your tea at the Lounge of the hotel with the enchanting harp melodies on every Sunday & Saturday between 3pm – 4pm. •	Wednesday Vibes; make Wednesday night jazz night at Summit Bar & Terrace, with smooth sounds, trio performances and breath-taking view of Bosphorus. Every Wednesday between 20:30 – 23:30. •	Summit Beats; warm up your winter nights with the rythms of a DJ. Every Saturday between 21:00 – 02:00. 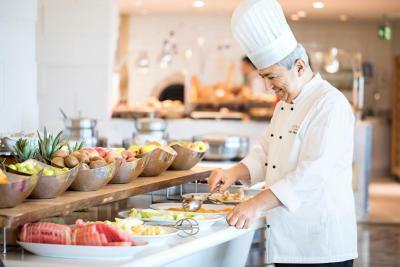 •	Sunday Brunch; have a lovely weekend at Manzara Restaurant with the variety of the delicious foods at Every Sunday between 12:00 – 15:00. 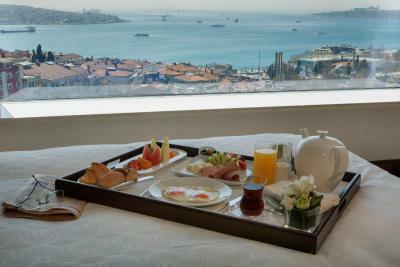 House Rules Conrad Istanbul Bosphorus takes special requests – add in the next step! Conrad Istanbul Bosphorus accepts these cards and reserves the right to temporarily hold an amount prior to arrival. Please note that the rates on this website are quoted in EUR but that guests are charged in local currency at the front desk. Rates are based on the daily exchange rate. Children under the age of 6 can benefit from food and beverage services free of charge. For children between the ages of 7 and 10, 50% discount is offered. The regular fee is applied for guests aged 11 or older. Guests under 18 years of age cannot be accommodated without their parents. 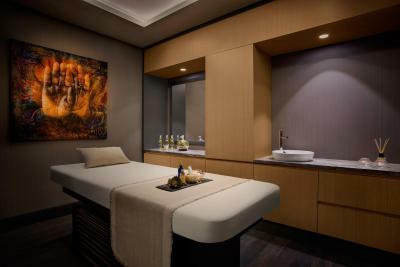 Conrad Istanbul Bosphorus offers 4 different luxury bath amenity brands: Tara Smith Vegan Hair Care, Refinery, Aromatherapy Associates, Shanghai Tang. Guests can choose from four distinct bath amenities.